There are a number of historical and religious places and towns around Varanasi that are worth visiting. There are a number of historical and religious locations around Varanasi that are well worth visiting. Some of the important and famous spots are Chunar, situated 40 kilometres from Varanasi. In mythical times, Bhartrihari took what is termed Samadhi (which is meditation until death) to live inside Chunar Fort. This historical location is also associated with one of the greatest warrior rulers, Sher Shah Suri, and several attractions inside the fort include Sonwa Mandap, the Sun Clock and a huge well. The fort also offers a splendid view over the Ganga River. Adventure tours are available betbeen 08:00-10:00. If you have any special requirements, please let us know. We will do our best to assist you! for 1 - 3 people @ INR 4000/- (extra person @ INR 1000/-). Duration of tour: 5-6 Hrs. The tour includes a comfortable & air-conditioned vehicle with cold mineral water available. You will have the services of a knowledgeable & experienced tour guide who will meet you at your hotel or guesthouse and accompany you to to Chunar Fort or any of the locations identified below. 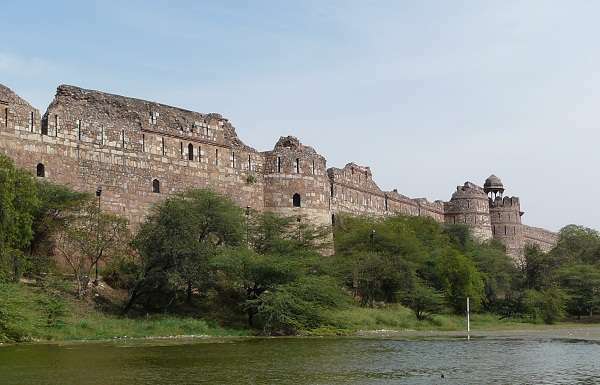 For example, at Chunar Fort, you may wish to stop at a few places and visit some hermitages to appreciate the natural beauty of the countryside. Other Places of interest: Sitamarhi (77km from Varanasi) - a mythical hermitage of the sage, Valmiki, who is the author of the famous Ramayana. There are also the shrines of Sita and Valmiki; the Chandraprabha Wildlife Sanctuary (70 km from Varanasi) which is a forest within which nestles both the Rajdari and Devdari waterfalls. The Chandraprabha Wildlife Sanctuary is a beautiful, secluded spot, ideal for relaxing or enjoying a picnic. Vivdhyachal, the Goddess‘s Sacredscape: In India, the concept of “Shaktipeeth” exists which, loosely translated, are places wherein the Goddess of Power (or the female aspect of power) allegedly resides. The female aspect of power is called Shakti and is worshiped in the form of the Goddess Durga. There are as many as 51 Shaktipeeths in India – and Vindhyachal is one of them. Situated 90 kilometers from Varanasi, Vindhyachal is well worth visiting for the experience. The location is famous for its temples, namely Vindhyavasini, Asthbhuja and Kalikhoh. According to Hindu mythology, when Sati died, Lord Shiva set out on a ‘world tour’ carrying her body around the world. In the ensuing days, Sati’s body started decaying and disintegrating. It is said that the left toe of Sati fell at the very spot where the current temple of Vindhyavasini stands. The temple is on a very low hillock and it is believed that the Goddess Durga had established herself here after having killed the demon king,Mahishasura. Thus the Goddess Durga is referred to as Vindhyavasini in this region. If you have any queries about our tours & services, then please get in touch at kashijourneys@gmail.com or on 0091-9452206434, we will glad to answer you.